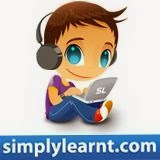 SimplyLearnt wishes all the aspirants of IIT-JEE 2010 a good luck with their examination. We advise to use the last bit of time wisely and punch as much revision as you can. It is very important that the sucess of student should entirely depend upon his perseverence and hard work rather than depending upon his luck. An IIt alumina venture .They are providing 43 DvDs contining 300 hours of lecture complete your 11th ,12th ,IIT ,AIEEE ,BITS SYLLABUS in just 6 months studying 30 mins a day.